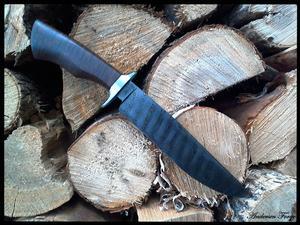 This one, right here, is about an 8 inch blade of 1095/410 stainless steel San Mai. The customer wanted a hot-blued guard, and I think it was a great idea!! 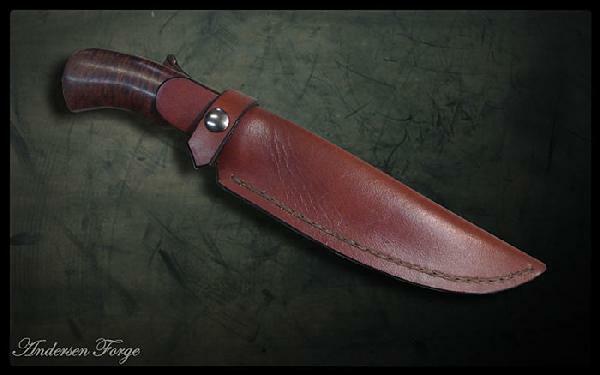 And quite possibly my favorite handle material - Australian Ringed Gidgee. 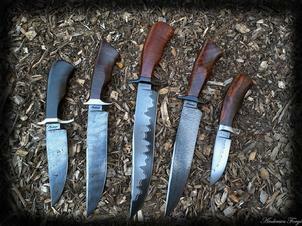 Like the one further down this page, a knife not too big for the small jobs, and not too small for the big jobs. The S.O.B. guard is from a piece of 1903 wrought iron that I twisted and deeply etched to show the unique grain of this material. 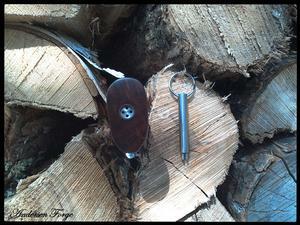 The handle is a piece of stabilized Black Ash Burl that I dug out of a neighbor's shed. Really. Yep - she's a biggun. 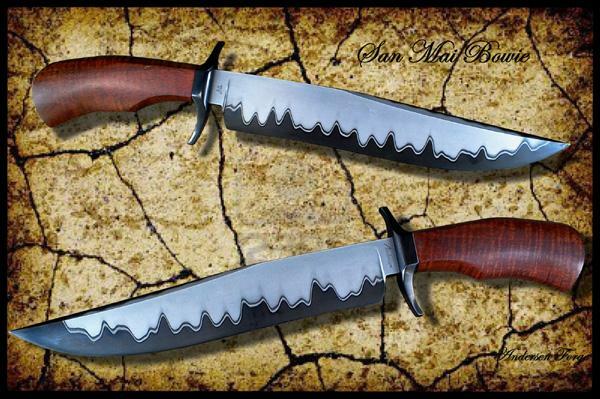 10 1/4" of San Mai goodness. Perfect configuration for the discriminating collector of fine cutlery! I put these pictures in here of this group simply because I just really dig the photos. 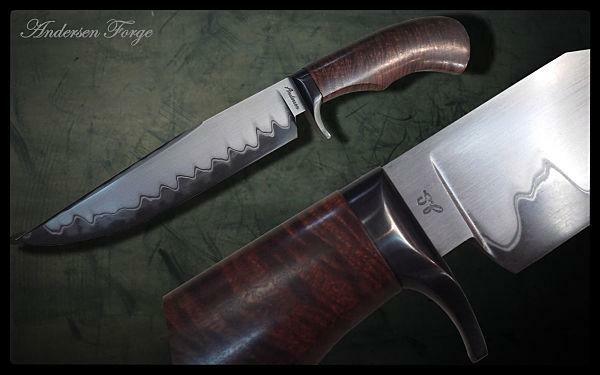 Just another really sweet little Andersen Forge hunter made fomr my 1095/410 Stainless steel San Mai recipe. Not only does it result in a stunning display only seen in this mixture, but it results ina nearly indestructable blade. You just ain't a-gonna break this thing with the stainless jacket. 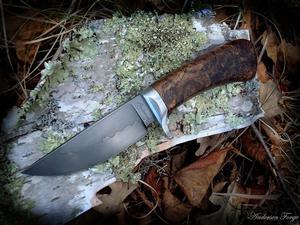 A very nice piece of stabilized Missouri black walnut rounds out the belt knife package. 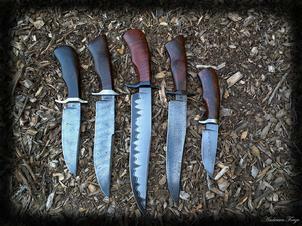 A knife that can handle it all - not too big for the small jobs and not too small for the big jobs. From dressing small game to splitting kindling. 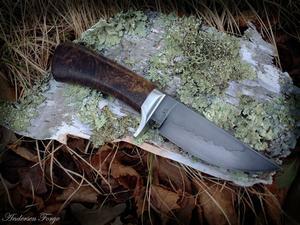 The blade was forged from a billet of high layer single twist Damascus. The take-down fittings are stainless steel. 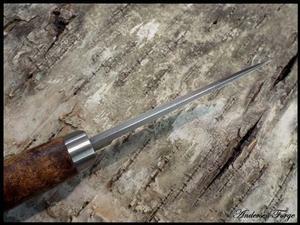 The fabulous handle is from some "Feather" Walnut that has been stabilized. I actually want one of these myself. There's just not a lot I can say about this knife. 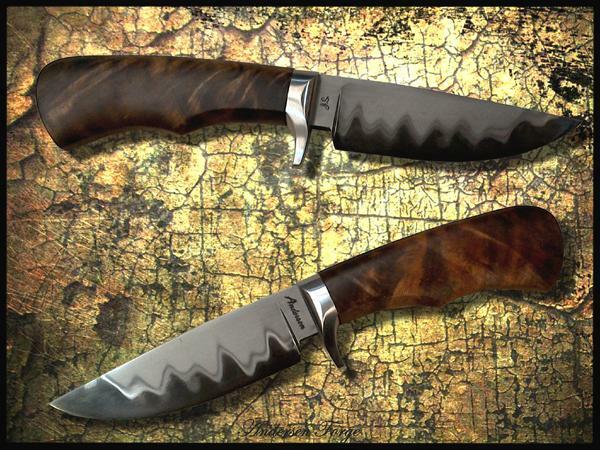 The handle material is a purely exquisite example of Ironwood that is nearly impossible to find anymore. It has figure that runs through and through and has no end. 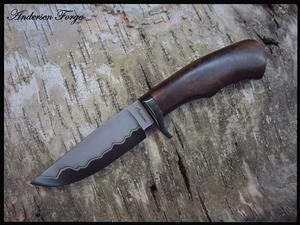 That handle material graces what I call and fine example of an Andersen Forge Hunter. 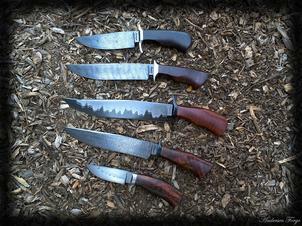 Everything a hunting knife should be. 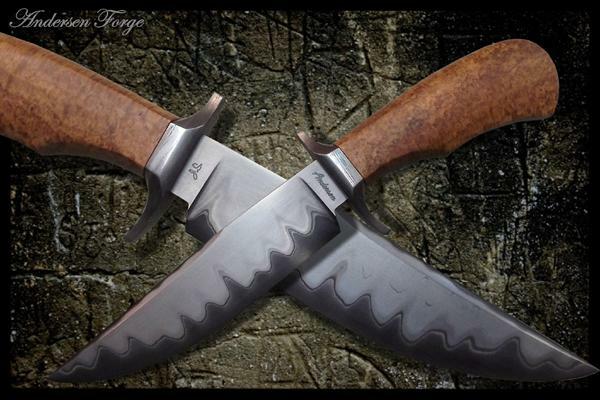 The blade is W1 tool steel and the takedown fittings are stainless steel. 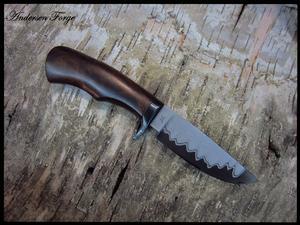 The finial on this knife is the same as the Gidgee Fighter below it. 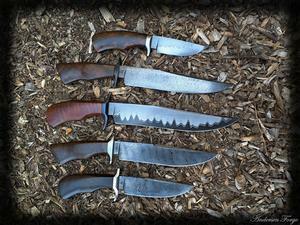 If you order a hunting knife from me - this is the style I would recommend. 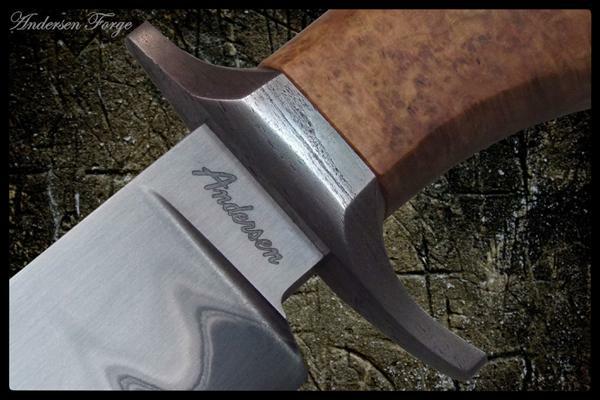 Now here is a great example of an Andersen Forge Fighter. 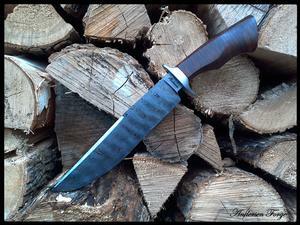 This blade was made from a high layer single twist billet of Damascus. I find that a high layer count is far more desireable in a single twist than a lower layer count. 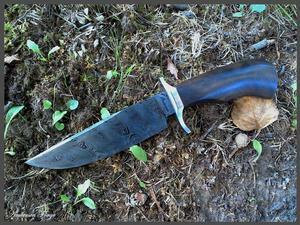 The blade was also hot-blued. I have recently found a new "connection" in Australia for Ringed Gidgee. Gidgee is basically the same tree as Koa - which is grown in Hawaii - except that Gidgee grows in the arrid outback of Australia, making for the third most dense wood on the planet. 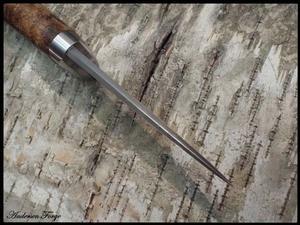 As well, I created the first four-pin finial I have made in over three years. I just recently upgraded some shop equipment making this process much more accurate and repeatable. And, customers have been asking for it. 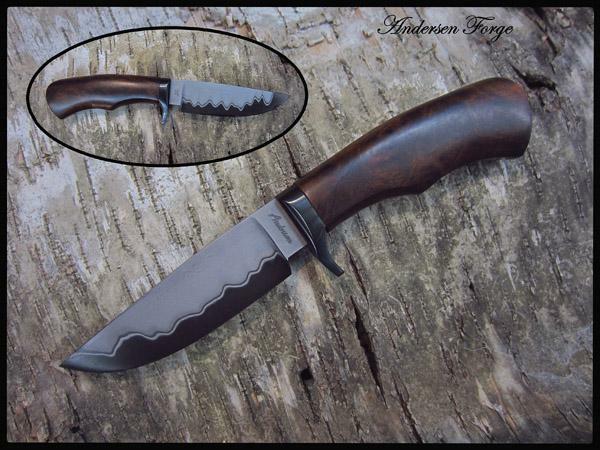 Perfect knife for getting attention in hunting camp. 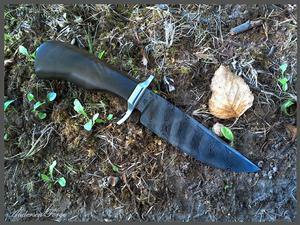 I forged the blade from a large round bar of W1 tool steel - same steel used to make drill bits and punches and such. During hardening, I used clay to create the distinctive hamon. I found this stabilized and spalted Maple Burl in Little Rock during the knife show there in February. This stuff has eyes on top of eyes!! I really do like the way W1 responds to my style of heat treatment and it performs exceedingly well. If you're looking for more in a classy hunter, I reckon you'll need to look somewhere else. In my mind, this is about as good as it gets. 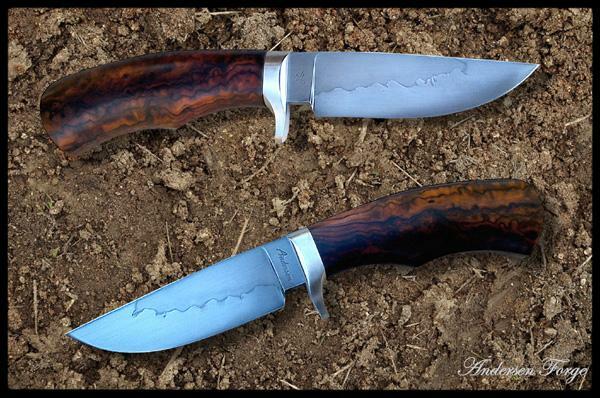 A 1095 and 420 Stainless Steel San Mai blade with an extraordinary piece of stabilized highly figured Walnut and hot blued take-down fittings. It makes for quite an impressive package. This li'l sweet thing will open eyes no matter where you go.